On Hold Insufficient credits, click on the live button to know the required amount to be added in the wallet to make the order Live. Live orders only printed and dispatched. Live OOS(Out of Stock) The Product is not in the warehouse. To check in-stock date: products -> No Stock Report. Live The Live status confirms the product is in stock. To be Printed The Product ready for printing. Printed Ordered Product gets Printed and ready for Dispatch. Packed Orders dispatched from our side. Delivered The order gets Delivered to the Customer. Cancelled The Cancelled Order (Orders can be cancelled only in Live oos and Live). Returned The Order is Returned (Orders -> Return Management), you can reship it to a new address. Select the Print Type, Style, Size Quantity, Placement, Select Design. To upload your design, Click on Select Design -> select Design Your Own. The mockup open for selected Placement and Colour. Click on upload Design and upload your file. Your design file can be maximised or minimised, Height and Width of the design can be changed by resizing the design file. Depending upon the Design Quality, DPI and Design File Print Quality is calculated. Design File Quality: Good and Average can be printed to get the desired output. For Poor: we can print but the output will be pixelated design so, avoid poor quality design file. Click on Add to Order to save. The uploaded design file is saved, to order the same design next time no needed to upload it. Its found below the model photos. International Orders: Select the courier as self and mail the address details to care@qikink.com with the order number. we are not doing COD for international orders. For International Shipping Charges Click Here. Click on save order, the Order is placed. After sign up with Qikink, WhatsApp to 9787113135 requests for google drive link with your registered mail id. Orders -> Upload Bulk Orders. Download Required Excel sheet. Fill the order number, Gender, Style, colour, Quantity. We share the drive link, so that you can upload the designs in the drive while filling the excel the sheet make sure that the design code and name as the design file name in the drive. The design on the Drive needs to be: 300DPI. Empty spaces needed to be trimmed. Png or tiff format. Fill the excel sheet: if the order contains multiple products enter the same order number and same address in the excel sheet and for COD orders additionally Rs.50 is charged and after we receive the COD amount from the customer the amount is credited to your wallet. To place COD or Multiple Products in the same order: Click Here to view. In the Excel sheet, you cannot add more than two placements. To Print two different designs on the same t-shirt fill first and second design, placements on the same row. First design URL and Second Design URL: Give the link of reference images so that we can see the placement of the design and print it accordingly. Courier Type Self: Courier label is provided from your end. After placing the order(orders-> all orders, in the action tab + symbol is added to upload your courier label) Qikink: Shipping is handled from our side. while filling address details Address line 1(min 4 char) and Address line 2(min 4 char) needs to be filled. Upload the excel sheet, the order is placed. Method 3: Save Design and Place Order. In this Method, the order can be placed through orders-> create or through Excel sheet. Design Files Needed to be saved. Design file: 300DPI. Empty spaces needed to be trimmed. Png or tiff format. Select the Print Type, Style, Size Quantity, Placement. Click on the select design ->the saved designs in the design list will be listed. Select the required design file. For Ordering through Excel Sheet: Orders -> Upload Bulk Orders. Download Required Excel sheet. 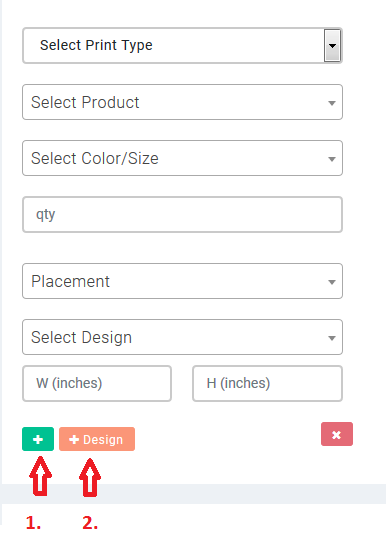 Enter Design name and Design code as exact that entered in the Design list otherwise it will be placed as a plain t-shirt order. Design height, width, url, leave it as empty.